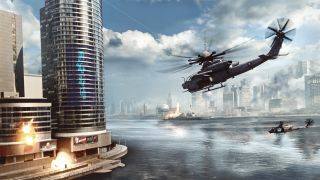 Standing in the Battlefield 4 multiplayer pen at E3 last week, three PC Gamer soldiers—Evan Lahti, Tyler Wilde, and Cory Banks—joined 61 other players to fill Shanghai with rubble in mortal pursuit of flagpoles. Now our barely-veteran squad has gathered to swap virtual war stories; our impressions from one battle in DICE's next big war game. Watch the video highlights from EA's demonstration above for more context (though note that our match wasn't quite as organized). Tyler: I probably would have started the match just like I play BF3 (as a sniping jerk), but I spawned without a primary weapon—a bug with my usual SV-98—and had to run across the map to pick someone off with my sidearm from across the 'U' shaped bay in the center. The 100 meter pistol headshot was a satisfying personal achievement, but one or two kills doesn't accomplish much in BF4, where respawns come fast and point captures either require a distraction to vacate the defense, or a relentless barrage of shells and bodies. It was mostly the former on this map. For such a large, symmetrical map, the battle was very asymmetrical—points were being back capped regularly, so control kept sloshing back and forth. I was always on one side of that bay fighting for the other side. Cory: That's not a bad start, really. I crashed a heli in the first 30 seconds. It was glorious. After I got serious, I spawned in as an assault and had a few quick firefights with opposing ground troops. Though for a long while, I didn't really see anyone at all. Preparing for the battle in a pit of PCs at E3. Evan: We were playing on Siege of Shanghai, which DICE's general manager called its most-ambitious map ever when I talked to him at E3 . We only played a single round, and E3 isn't always an honest showcase for how a multiplayer game will feel, but I didn't like how the map flowed. A pitched battle never developed around any of the capture points, and it felt like we were simply base-trading empty capture points. 64 people were in there—we were standing right next to them—but the game felt empty, even desolate at times. Tyler: Yeah, the map is ambitious—fighting in and out of a skyscraper is an exciting idea—but on the ground it feels like the evolution of my least favorite BF3 infantry maps, Operation Metro and Grand Bazaar, only gianter and quieter. Some of that's my fault—I never made it into a vehicle, and spent too much time on foot. Went for a nice swim in the middle of the match, too. But I wanted a sense of the infantry game, and I got it—it's Battlefield 3 with a bit more room to move. Sniping, for instance, is unchanged: same bullet parabola, same glowing tracer to watch, and it's a headshot or nothing. That's not a complaint, because BF3 is one of my favorite games to snipe in. Even more than Red Orchestra 2, I'd say, mostly for the exaggerated bullet drop. I love the challenge. We weren't able to try Commander Mode, but this is what it would've looked like. Cory: I liked the feel of the ground vehicles I hopped in to. They felt ever so slightly less arcadey than previous BF games. Manning the turret on the tank led to more than a few satisfying kills—until a rocket blew the tank apart. Tyler: I blew stuff apart in my own way, mostly by shattering giant glass windows behind enemies who thought themselves unseen, then watching them flip out and bolt. That was fun. Oh yeah, and then a skyscraper collapsed. Cory: Gotta admit, that was impressive. Tyler: I think the most tactically significant thing about it was that everyone stopped shooting to watch it come down. After the dust settled, I immediately clambered onto the new island formed of its debris, which made a great sniper's nest, but I was a bit disappointed when I considered how it would probably form the same way in every match (I'm so hard to please). The coat of dust which settled over the rest of the map was impressive though. Evan: And god, the sound design. Every time I pick up Battlefield it just cements how separated DICE is, sonically, from every other studio on the planet. The clickiness of bullets knocking against concrete, or around your head, conveys each individual shot through chaos. Tyler: Yeah, the suppression effect is great, and I wish we had seen some bigger standoffs, with groups of ten or more firing at each other's positions. That would have been a hell of a show, but I spent more time in groups of two or three, getting a bit lost in the vastness of the map. Cory: Here's my concern: Nothing here felt like a vital, important change compared to Battlefield 3, especially with some of the deals floating around for that game and its expanded content. Are we supposed to move to BF4 just for destructible environments and the latest maps? Tyler: I'd be surprised if DICE has already played all its cards, and we may get a boost of confidence after then next big reveal, but I also wish we'd seen more tweaks to the core BF3 experience. I don't like how either game handles death, for instance. They both snip the cable to my mouse, forcing me to helplessly watch a canned animation that replays every single time I eat it. It's frustrating the first time, and more frustrating every time after that. Death doesn't have to be miserable, though—just ask Rising Storm . Instead of kicking me while I'm down, RS dumps me right back to the map to start thinking about my next moves, and every death feels significant. When I die in a banzai charge, for example, I can imagine—whether or not it really happened—that I distracted a machinegunner long enough to save the life of a teammate. I don't even mind being killed by some unseen rifleman from 150 meters. My death communicates valuable information to the guys around me, such as, "You should definitely start running now." I'm the war movie extra who has to take a dive into the dirt for the benefit of the scene. BF4 just doesn't hit that note. Death is a timeout; a punishment more than anything meaningful. That's a small criticism (and to be fair, I'm momentarily captivated by Rising Storm, so I'll use just about any opportunity to talk it up), but notable to me as something gone totally untouched in this iteration. Granted, what is new is very appealing. I especially want to see Siege of Shanghai's scale replicated in a non-urban map (just my preference) and more big destructible set pieces. Oh, and more of those boats with the escape jet skis. Battlefield Bond moments are highly encouraged. For more from E3 2013, check out our complete coverage .